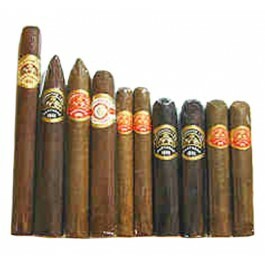 Dominican Partagas cigars are renowned for their consistancy in terms of quality and flavor. The Partagas Cigar Sampler now includes 10 handmade Partagas classics: 1 Partagas Cifuentes Septiembre (5 1/2 x 49) which is - a Special seasonal release only available for a very short time, 1 Partagas Series S Preferido, 1 Partagas Spanish Rosado Mitico, 1 Partagas Black Label Pyramide, 2 Partagas Robusto, 2 Partagas Black Label Bravos & 2 Partagas No.4 cigars. Sunstitutions may be made from time to time, based on current availability. 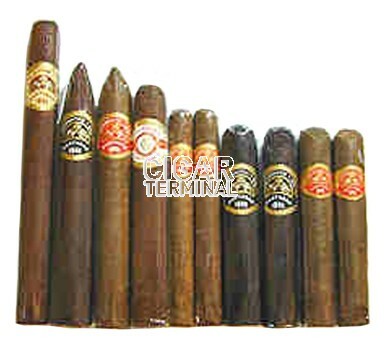 Always with equal or greater value cigars!